Men often get a bad rap from us women: thinking they’re kind only when they want something. 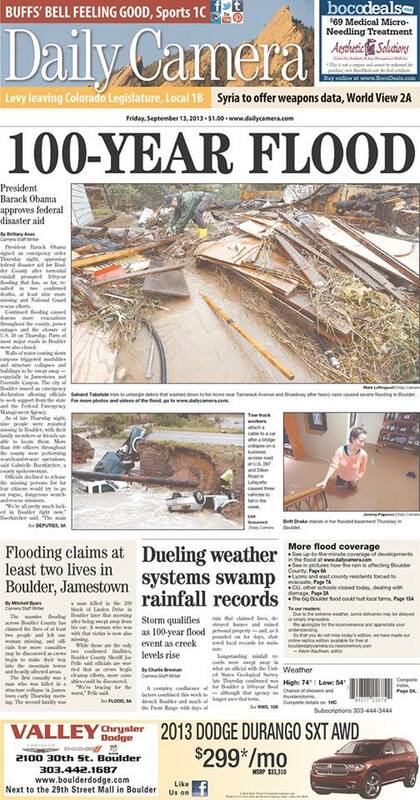 I hope my experience during the Boulder Flood changes a few bad raps. As I sat on the second story of my house watching the raging river that used to be my street crest onto my driveway, I listened to the online emergency scanner and began to shake, unable to feel my hands. At first I thought wow I’m cold, but then realized I was experiencing trauma. I heard the dispatcher announce “all rescue units seek higher ground, the city of Boulder is impassable”, and at that point, went into full blown panic. Sirens were going off, the night was pitch black and I could hear the rushing water going past my front street and behind my house, as the usual small trickle of a creek bed rose past its banks creating a raging river. While listening to my sump pump going off every 90 seconds, I realized I was mostly afraid of being alone. Since I’m currently single, feeling the cold isolation of being solo in an emergency situation, hit home hard. So I signed onto Facebook. Immediately five male friends began messaging to see if I was okay. Two of them stayed online with me until well past two in the morning. Another researched evacuation routes and listed multiple posts with maps showing which streets were closed. None of these men are single or available, they weren’t hitting on me, they were being kind. Even an ex of mine, an off duty fireman cruising the area to lend a random hand where needed, drove past my area just to check on things, and texted to see how I was doing. This man has a current girlfriend that he loves, so he wanted nothing from me – only to check in. Another husband of a friend offered shelter and reassurance at the same time I was reading a message from his wife offering the same. He had no idea she was messaging me, this man I’ve hardly spoken to, yet in the midst of a storm he reached out. The last time I looked at the clock, it was 4:45 am. The next morning I awoke to a male neighbor knocking on my door to make sure I was ok. He hugged me hard and didn’t let go as I pretended to be fine. The rains didn’t let up that day and he and his roommate- another man, took turns stopping by to check up on me. As it started to get worse outside and the waters rose, their visits became more frequent. They knew I was scared without my talking about it. Many women think men don’t get it, but they do. That night as it poured even harder, one of them came over just to sit and make me laugh. He asked if I had the Jets game on and even though I didn’t have that cable station, he stayed. So much for the stigma that men get lost in sports and hear nothing we have to say during a big game eh? Later that night a girlfriend texted that her husband was coming to town. It was pouring sheets of rain, flash flood alerts were being sent hourly and the emergency information online suggested no one leave their home unless evacuated. I texted back immediately telling her that stores were closing and he shouldn’t come. She texted back saying, he’s not going to the store, he’s coming for you. After midnight on the second day of rains, Boulder canyon surged sending a 30 foot wall of water through town as sirens went off and Facebook exploded with people wanting to know what was happening. I lost it and cried myself to sleep from exhaustion after day two of not sleeping and awoke to the sound of men scooping mud and debris from the street. I scrambled to get dressed and walked outside. Seems a raging rush of water had filled our street in the night and a group of men had waded through shoulder deep water to take down a fence and let the waters pass. Had they not, our street would have become a fish bowl as water pooled from the mountains. Under the morning light, I saw groups of men scooping mud, roping off dangerous areas and carrying furniture out of flooded homes. A few friends on search and rescue teams stood by to hop rescue helicopters and join dive teams. In the pink light of that new day, I realized our men are heros. They are there for us if we let them, and despite equal pay and equal intelligence, we need our men, we need our heros.